1. Please add one new testimonial in Russian language and check it is displaying correctly or not. 2. 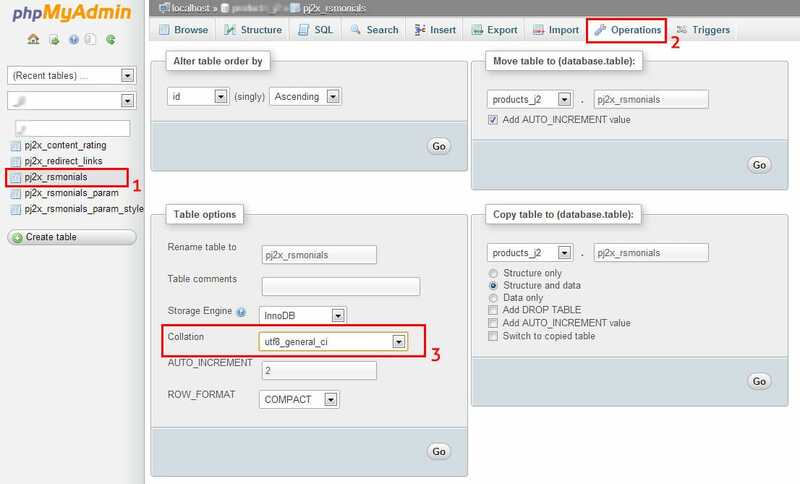 Please check the collation of the table “#__rsmonials” in your database. (here #__ can be any value) You may need to set the collation correctly for Russian language. Dmitriy: Thank you for your answer. 1. All testimonials in Russian are displaying incorrectly. Support Team: We can help you to figure our the problem. But for this you need provide us the access on your database and admin panel. Is it possible? Please let us know. Support Team: Thanks for all info. 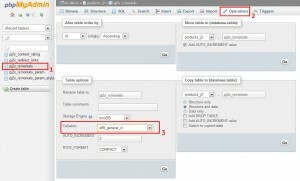 We change the collation in your database for the table “#__rsmonials” to utf8. Please test it your own and let us know it is working or not. Dmitriy: Yea, it seems to be working. Thanks, guys. You are the best. Support Team: Thank you. If you need any further help in future feel free to contact us using our support form. If you like our extension please rate us at Joomla extension directory (JED). I established version 2.2 RSMonials and blocked IP of the commentator in the administration panel. How to remove blocking of IP? Go to “Joomla Admin” => “Components” => “RSMonials” => “Settings”. Here you can get one settings of blocked ip addresses. Hello! Installed this extension on the Russian site. Component displays all information in English. I manually corrected all in Russian in the file language / ru-RU / ru-RU.com_rsmonials.ini. But how to make that functional components appear in Russian? The admin panel is currently only available in English. You can translate the front-end only. ок. how to change the display language component functions on the site? Sorry for bad english. I ask easier – how to choose the language in which to display the component on the site? Just changed all the words in Russian to English language file. I’m sorry for your trouble. Yes, you need to edit the default language file. first, thank you for the fabulous component. I really liked it, am only facing one problem here. Unfortunately categorization option is not available currently on our component. We will surely implement it in our next release. I have same problem, but doing the step in this guide don’t solve the problem. If you wish us to solve the problem in your behalf then please contact our support team.